The next big wash will be on the coconuts. I have puddled some clear water onto the areas of the coconuts that I will be adding pigment to. Allow the puddled water to soak in just a little to sink into the paper. 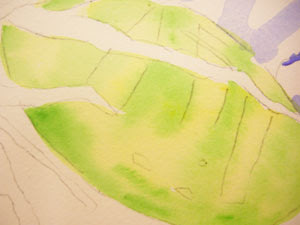 This will give you more time to add colors and tip the paper, which will blend the pigments. I want to use a rather strong concoction of Aureolin Yellow and a little New Gamboge, here and there. Since the paper is already wet it will dilute the pigments. I drop some yellows into the wetted areas of the paper. The bottom coconut is in a little more shadow, so the colors will appear cooler. 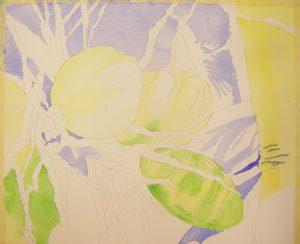 I use the same wet-in-wet method to drop in some yellows with the addition of Permanent Sap Green. Again, I have used the same method to add some greens to the coconut on the very lower left of the picture. I have also added some yellows to the palm tree trunk at the right. Don't brush too much. Put your brush down and pick up the board. Tip it back and forth and allow the water and pigments to blend with gravity. Don't let them blend too much, as this takes away the effect of the soft edges of color transitions.